One log, tree stumps and the tops of six boulders. Look at the pictures. Count them yourself. We decided on the program yesterday that the stand of stumps resembles stonehenge. 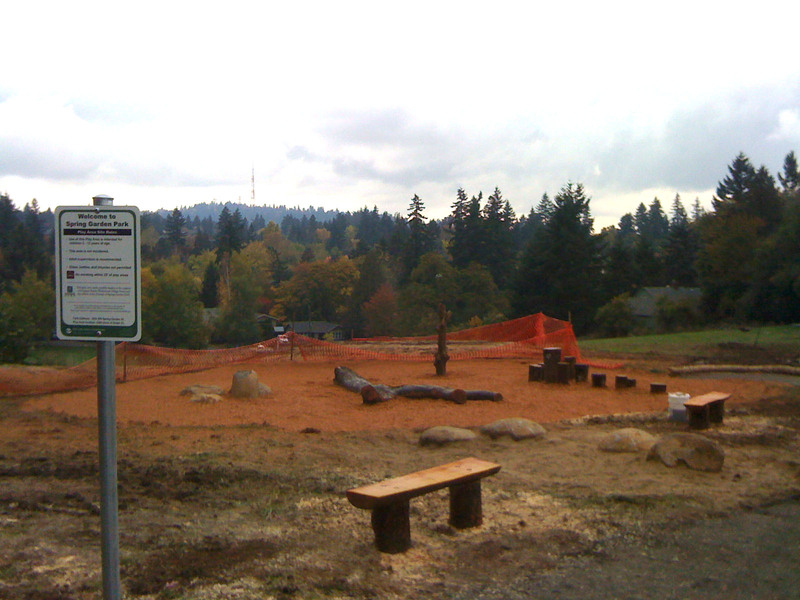 The log was “donated” by Tri Met after they whacked the trees along an avenue they’ll stick unaffordable light rail on. 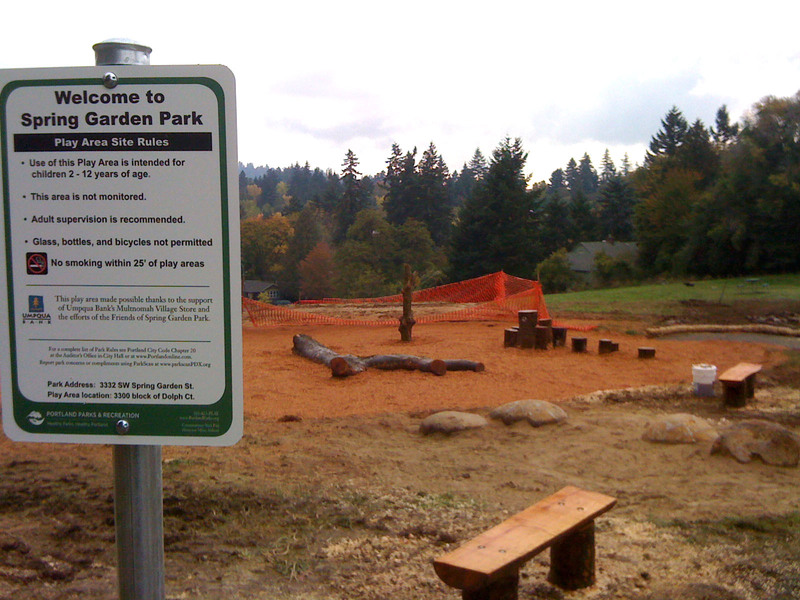 In addition, TriMet donated a tree from their property on Lincoln Street to supply wood and materials to the project. The tree had to be removed during construction of TriMet’s Portland-Milwaukie Light Rail project. 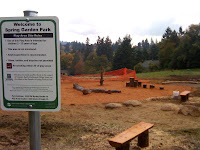 Umpqua Bank donated the money to build the playground. Park’s Commissioner, Nick Fish, says the playground at 3332 SW Spring Garden Street may remind adults of the imaginative play from their youth. Precious Portland. Have fun kids. All they wanted to do was present the scientific argument that diverged from the official Oregon political stance on man made global warming and the inquisition erupted. The meeting was cancelled, aspersions were cast and Oregonians saw what happens to apostates who veer from the orthodoxy of the Church of Global Warming. As you read (here) on Saturday, the Oregon Chapter meeting of the American Meteorological Society was to meet in a room at OMSI for one of their regular meetings. Presenters included Astro Physicist, Gordon Fulks, PhD; former Oregon State Climatologist, MS in Meteorology and consultant, George Taylor and Meteorologist Chuck Wiese. AMS asked them to present an alternate view to anthropogenic (man made) global warming–AGW. OMSI cancelled the meeting. Why? 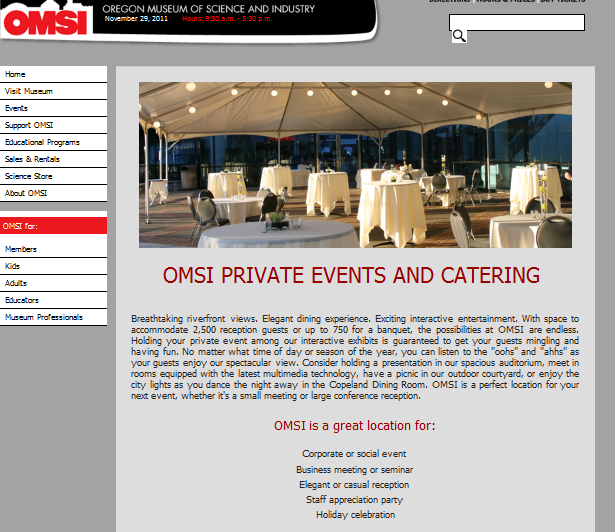 OMSI got word to the group that anyone meeting in any of its rooms must deliver peer reviewed information. They also told a person who called to ask them about the cancellation that the presentation wasn’t balanced because it failed to contain the other viewpoint on AGW. At least one Portland State University professor made a call to OMSI to silence the troika. he admitted that it was PSU that called attention to it and complained. Balance? Let’s never mind the fact that the entire government apparatus–local, state, national, United Nations; crony capitalists like Solyndra and GE; and the mainstream media have gone all-in on the increasingly rickety hypotheses about man made global warming (anybody want to buy a Volt?). No, OMSI wants the ‘other side’ presented. What a laugh. 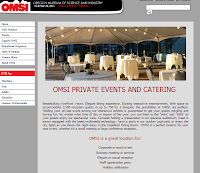 It seems a rather hysterical reaction to a group that just wants to use a room at OMSI.Do you suppose OMSI scrutinizes the groups this severely if they want to use any of their facilities? It wouldn’t seem so. In fact these rationalizations were never conveyed to the head of the AMS Chapter, Steve Pierce, as he explained to me at noon yesterday’s on program (here). If they had maybe they would have found out that the information is, in fact, peer reviewed. OMSI claimed in today’s paper that it had told the group back in November it would cancel if they didn’t capitulate to their demands. That also comes as news to the AMS Oregon Chapter President. 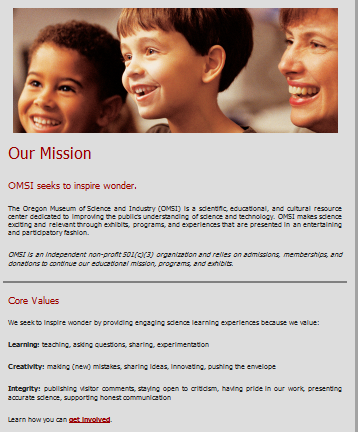 OMSI claims its Mission is dedicated to the public’s understanding of science. No it’s not. If that were true these scientists would have been able to present theirs and others’ peer reviewed research. This financially troubled, bailed out, government beholdened entity is just dedicated to politics, the people on its board and political correctness. Everything but science. When one of the would be speakers at this presentation, George Taylor, was forced out of his State Climatologist’s job by the Governor because of his AGW Apostacy, it served as a cautionary tale to others–including OMSI–that the Inquistion was just beginning. Imagine that: sent to the dungeon for reckoning that the earth–gasp!–goes through natural cycles of warming and cooling irrespective of man’s influence. But apparently the OMSI board and those fancy professors don’t read much. Their theory that wins them favor at West Hills cocktail parties, grants and speaker’s gigs at the toniest confabs in Doha and Aspen is crumbling with every Michael Mann and CRU email release. “[Earth has] five hundred volcanoes, and an eruption every two weeks. Earthquakes are continuous: a million and a half a year, a moderate Richter 5 quake every six hours, a big earthquake every ten days. Tsunamis race across the Pacific Ocean every three months. Our atmosphere is as violent as the land beneath it. At any moment there are one thousand five hundred electrical storms across the plant. Eleven lightning bolts strike the ground each second. A tornado tears across the surface every six hours. And every four days, a giant cyclonic storm, hundreds of miles in diameter spins over the ocean and wreaks havoc on the land.